Google Maps is a navigation app for Android and iOS which supports voice navigation, saving maps for offline usage, and voice command. Updated hourly with data from the company that has mapped most of the known world, you will not find a more accurate or up-to-date map. Google Maps provides you with several different filters to view maps through, including satellite, terrain, and traffic views. You can see the earth just as it appears to a bird flying over or you can focus your view on roads, streets, and paths with points of interest displayed all over. Even obscure hole-in-the-wall shops are often mapped on Google, and Google will make recommendations for local activities, restaurants (complete with Google user reviews), and other local places and events. Once you have chosen a destination, you can use voice navigation to tell you how to get from your current location (autodetected using satellite) to your final destination. Whether you are walking, biking, taking public transportation, or driving your own vehicle, Google Maps shows you step-by-step the most efficient route to reach your destination. Live traffic updates, rerouting, and lane assist functionality ensures that you never miss an exit or wonder if you are on the fastest route again. 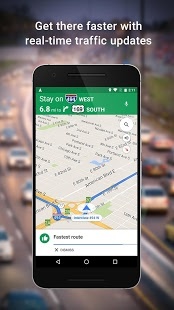 Now both Android and iOS support saving maps offline for navigation even when you don't have reception or a data connection. Google will even suggest a map area to save based on your home and work address and often-traversed areas. Voice navigation with live traffic updates, lane assist, and rerouting. Save map areas for offline navigation. Most up-to-date maps with millions of points of interest. Several different filters to view maps. Suggests nearby activities, restaurants, and more. Does not currently support saving whole states for offline navigation. CALL_PHONE: Allows an application to initiate a phone call without going through the Dialer user interface for the user to confirm the call. BLUETOOTH_ADMIN: Allows applications to discover and pair bluetooth devices. DISABLE_KEYGUARD: Allows applications to disable the keyguard if it is not secure. GET_PACKAGE_SIZE: Allows an application to find out the space used by any package. INSTALL_SHORTCUT: Allows an application to install a shortcut in Launcher. NFC: Allows applications to perform I/O operations over NFC. READ_SYNC_SETTINGS: Allows applications to read the sync settings. WRITE_SYNC_SETTINGS: Allows applications to write the sync settings. 어디를 가든 무엇을 타든 길찾기 최강! 네이버 지도앱!! Offline GPS navigation & maps of 64 countries.Try popular navigation for free!